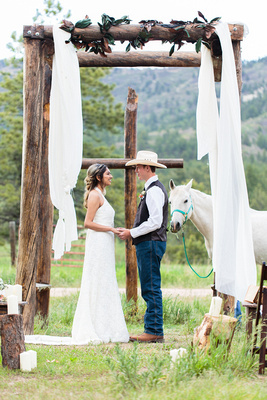 Snow Creek Ranch Larkspur is the perfect spot for your Traditional Wedding, offering distinctive services for your ceremony, reception, and revelry – woven into rolling hills and picturesque vistas… choose a true Colorado ranch experience for your eco friendly wedding! Upon arrival on our beautiful farm, our staff welcomes you with warm smiles, open arms and a deep commitment to helping each couple meet their own personal vision of the perfect wedding. Walk our rustic bridal path, adorned with sweeping views of Raspberry Butte to begin your life together. Celebrate an intimate or wide open air ceremony, framed by a rustic cross, chuppah and traditional wedding arch. Then enjoy a deliciously romantic celebratory feast, individually crafted by one of our acclaimed local partner chefs. The staff is so easy to work with, and the setting is beautiful, with amazing views! Even when an unexpected thunderstorm moved in, and put us behind schedule, they were all absolutely wonderful in helping the day continue on so perfect and smoothly! I’ve already referred two of my friends. 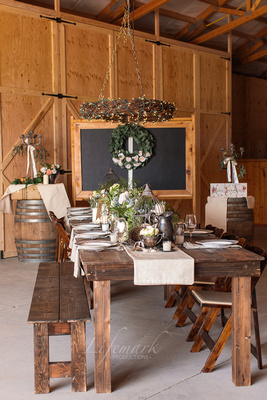 To visit the farm, arrange a tour, or for more information regarding our services, call Michelle at 844-34-ANGUS (844-342-6487) x 501 or email Events@SnowCreek-Ranch.Com. Set on 35 acres of wide open space, and offering stunning mountain views, Snow Creek Larkspur is a working family farm, conveniently located less than an hour from Denver or Colorado Springs in beautiful rural Douglas County. Our indoor and outdoor options for your ceremony offer an ideal combination of western charm, elegant surroundings and attentive service. A network of wedding professionals at your service. Visit Our Partners page to find links to their websites. Sound system with auxiliary cord / iPod connection and microphone. 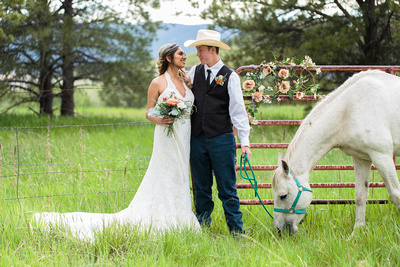 Please read our ranch wedding and rustic event Rules, Regulations, and Inclusions for renting Snow Creek Larkspur for your next function. Snow Creek Larkspur is proud to provide eco friendly wedding services. Responsible stewardship of our land is an important part of our calling to safeguard and replenish the earth. And we understand that protecting and preserving our precious environment is an important element of any Colorado couple’s decision making process when it comes to planning their wedding. Thanks to these steps, and to our careful attention to every environmental detail over which we have control in all aspects of our operation, our facility actually has a negative carbon footprint, as well as a minimal water usage footprint. Book Your Eco Friendly Wedding Today! Taste Of My Kitchen private chefs and Catering set out to become the premier catering events company. We strive for perfection in everything we do, from the organic ingredients to our exceptional service. 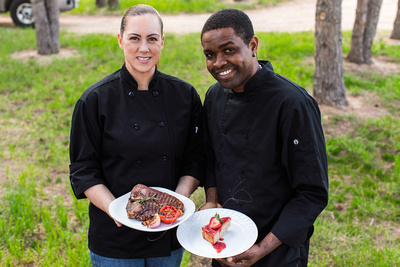 Our core business is founded on bringing the private chef experience to you. We pride ourselves on exceptional private dinners, weddings, cocktail parties, corporate events, and more. 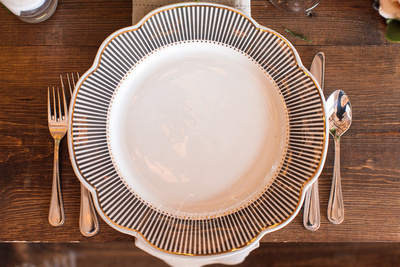 Flying Horse Catering is a premier catering and event company serving Denver’s Front Range and beyond since 1993. Our reputation has been built by providing outstanding food and outstanding service. It’s not just our profession, it’s our pleasure to serve you and be a part of your event. We provide catering for a variety of private and public events, such as weddings, social gatherings, corporate functions, concessions and community events. Call Debbie Dala at 303-688-4321 or email debbiedala@flyinghorsecatering.com. Visit Flying Horse online at www.flyinghorsecatering.com. Colorado’s premier rental company offers the finest wedding, party, tent and event rentals by providing superior, high quality equipment, friendly and knowledgeable customer service, and prompt delivery and setup by a professional staff to help make your event special! With two convenient locations in Denver and Colorado Springs, no party or wedding is too big or small for personalized attention. We work with you step-by-step to provide your choice of the broadest range of equipment in the region at affordable pricing.